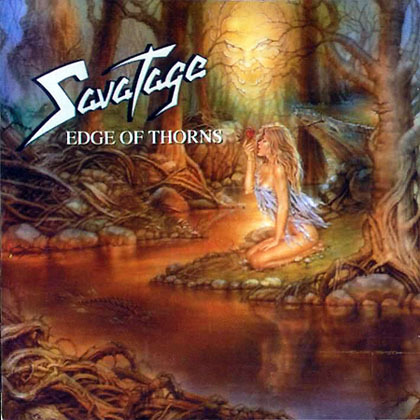 In the past, Savatage have been well known for their exceptional brand of piano metal. Hall of the Mountain King was their full realization of classic metal, Gutter Ballet was their marriage of the piano, and Streets was their dip into the dramatic rock opera genre. Each of these releases has something to enjoy, and each one has something different to enjoy, what does Savatage bring here? True progression. This is the album that began their deep rock opera/progressive drama obsession in the composition stance. Not a rock opera, itself, the songs play out as one, and are very well played. The melodies are phenomenal. Edge of Thorns has a haunting piano line opening the album, leading into the crunchy riff from Oliva. The lyrics are well written, and everyone is at the top of their game. This is the continuation of the bands musical peak (which was quite the stretch). Basking on more straight forward metal, He Carves His Stone melts face all over the place, with the infectious riff. A short dip in quality would be Lights Out, as the primary musical idea seems a bit stale, even if they rock furiously. Skraggy's Tomb does a damn fine job of returning the vitriol, and has a very unique driving line. I don't prefer Zak Stevens over Jon, but there is no doubt about his high quality as a vocalist. He powers through the songs menacingly. I just wish he had that lovable tired swagger Jon does so well. Labyrinths is the first of two expertly crafted instrumentals to be found, which do very fine jobs of injecting diversity into an already powerful album. Follow Me has the most socially critical lyrics, and I quite enjoy them. It also houses one of the catchiest and most ear pleasing choruses of the entire album. It is followed by the other instrumental, Exit Music. I feel that this is the overall prettiest moment on the disc, and worth hearing time and time, again. I never tire of that piano. Degrees of Sanity and Conversational Piece turn dark and enigmatic. Their lyrics of self mutilation and the ilk are done competently, and the musical themes they hold are fascinating. All That I Bleed is a ballad, and much more light in tone. It goes to show that Savatage were the top of the game when it came to adequately making this style of music. With piano lines twisted together alongside impassioned vocals and thick, meaty guitars and the palpable lyrics. Damien has a more aggressive assault, and rocks solidly. It is a short burst of anger before the album is taken to a closing. The final stretch of music in Miles Away and Sleep has to be described as beautiful. Miles Away has a more accessible rock style, with Savatage's unique edge and knack for unique melodies and melding of multiple transforming emotions within the same song. Sleep, is just heart touching. It has a very deep nostalgic mood, and I get so very much feeling from it. In all, this is where Savatage began their journey into progression on a full scale, and moved away from Jon as a main vocalist, while at the same time giving him even more spotlight as a pianist. There are no real weak moments, and the quality of the disc in whole is up the the high standards they keep setting for themselves. Not as altogether masterful as what came directly before, or would be coming in the future, but a truly seminal release for fans. Fantastic. Worst Moment - If I had to choose, Lights Out. **** stars Really straddling the line. But stars and scores don't matter. Just listen to the music in here, and enjoy yourself.